Construction has officially started for Star Wars Land and much of the focus we've seen from people is on the closures. And while we're still sad to lose Big Thunder BBQ, we wanted to think to the future today. After all, "Disneyland will never be complete. It will continue to grow as long as there is imagination left in the world." We're very excited to see what changes the next few years will bring and have high hopes. But, there isn't a ton of solid information out there yet about what we can expect to see in the new land. 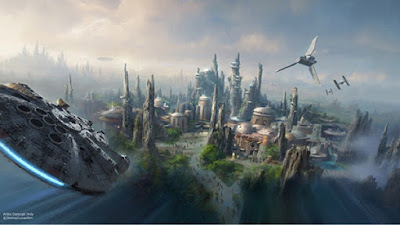 So we've put together the top 5 things we want to see when Star Wars Land finally opens. First thing's first: Star Wars Land is kind of a boring name. I'd love to see much more thought go into this one. I know most sections of the park have "land" at the end, but it's certainly not a requirement! With the BBQ closure, Disneyland needs another awesome restaurant, and what better than the famous cantina from Star Wars? An alien band should play and we should get some nice space themed meals that are still visually appealing...I'm looking at you First Order burger! We'd love to see a spot where kids can go in and be turned into Rebels or Storm Troopers, have Princess Leia buns, or even given cool alien face paint. It would be a great contrast to the glittery princesses that we see coming out of the Bibbidi Bobbidi Boutique. Basically what we know so far is there will be some kind of Millenium Falcon attraction where you're able to control the ship (yay!) and a Battle Escape (not the official title yet) which should be a water ride in the style of Pirates of the Caribbean. What we're hoping to see out of these rides is something worth all of the permanent and temporary closures they caused. More Radiator Springs Racers, and less Rocket Rods (remember those???). We're also holding out hope for an animatronic Han Solo on the Millenium Falcon, just so there can be two versions of Harrison Ford in Disneyland. For some reason, that makes us giggle. Seriously. You can't open Star Wars Land and leave a Star Wars themed ride stranded on the other side of the park. Is and goes for Launch Bay and the Jedi Training show. Just move them all. Especially with the new land only having two rides, a surprise move would be a wonderful addition to the new area and would give a great space for something new to move into Tomorrowland, which desperately needs a revamp! Such good posts should be more visible on your blog!